If you’re as lucky as us, you’ll walk into a candy store one day and find a chocolate, foil-wrapped Lincoln penny. And, at Easycupcakes.com, when life hands us chocolate Lincoln pennies, we make cupcakes. 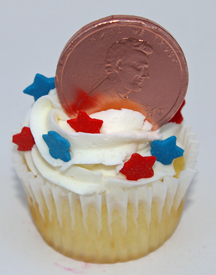 What You Need: 1 cupcake (baked and cooled); white frosting; large red and blue star sprinkles; foil-wrapped chocolate Lincoln penny; pastry bag and 1M star tip. How to Make It: Fit pastry bag with 1M star tip and fill bag halfway with white frosting. While squeezing out icing, move arm in a circular motion and cover the top of the cupcake with a swirl of icing. Then, starting a little bit in from the edge this time, make a second swirl on top of the first one. Place coin in swirl and add stars. This entry was posted on Sunday, February 17th, 2008 at 9:40 pm	and is filed under other holiday cupcakes. You can follow any responses to this entry through the RSS 2.0 feed. Responses are currently closed, but you can trackback from your own site.